Rose Geranium Organic, has very similar properties and uses to Geranium, but (as its name implies) has a sweet floral, rose-like aroma, which makes it widely used in perfumes. It is toning and rejuvenating and has a balancing effect as it can soothe without sedating, and uplift the spirits. Rose Geranium Organic is a pure therapeutic quality certified organic aromatherapy essential oil from South Africa, obtained from the leaves. The plants originated from South Africa as well as Reunion, Madagascar, Egypt and Morocco and were introduced to European countries such as Italy, Spain and France in the 17th century. There are about 700 different varieties of the plant, yet only 10 supply essential oil in viable quantities, since the normal garden geranium produce far too little oil for extraction. It is a hairy perennial shrub, often used in hedgerows, and stands up to about one meter high (3 feet) with pointed leaves, serrated at the edges. It has pinkish-white flowers. In early times geraniums were planted around the house to help keep evil sprits at bay. 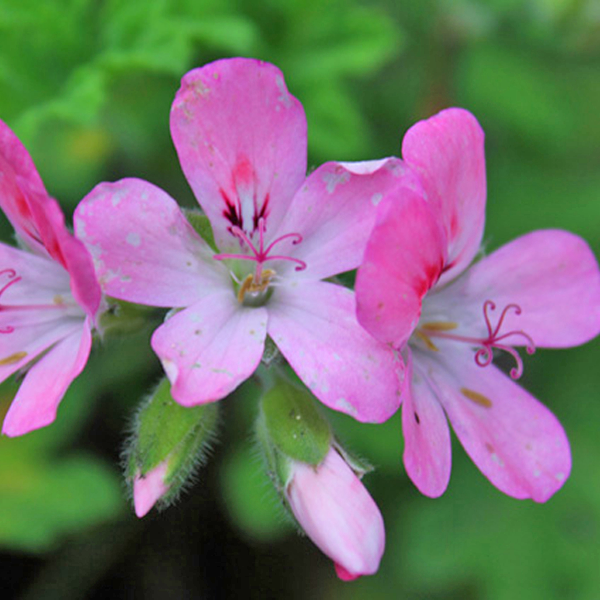 Geranium oil is extracted through steam distillation of stems and leaves of the geranium plant. Rose geranium oil has a sweet and rosy smell with a mint overtone. Rose Geranium works wonders to support the relieving of stress and anxiety. Due to its soothing effect, this essential oil is also ideal for improving sleep quality. Burners and vaporizers - In vapor therapy rose geranium oil can be used to help relieve stress, mild depression, PMS, anxiety and tension, menopausal problems and for general energizing. Blended massage oil or in the bath - Rose geranium oil can be used in blended massage oil, or diluted in a bath to assist with PMS, depression, stress, anxiety and tension. Cream or lotion - As a constituent in a blended cream or lotion, rose geranium essential oil can be used for clearing sluggish and oily skin. 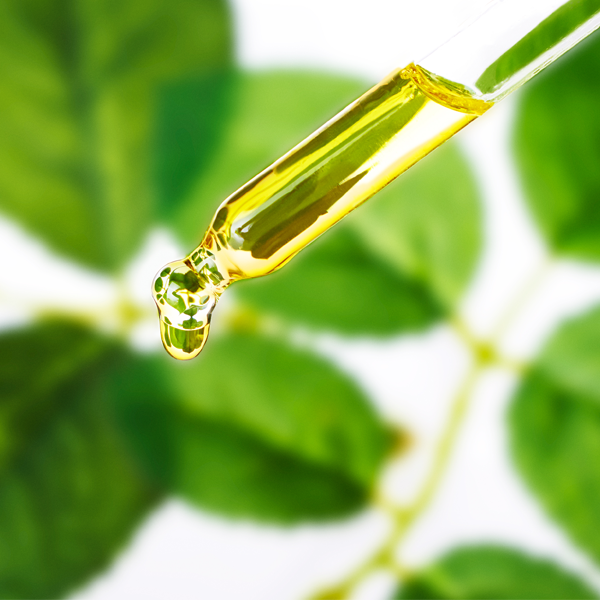 Shampoo - Rose geranium oil can also be diluted in shampoo to help with head lice. Rose Geranium Organic, Pelargonium roseum. Country of origin: South Africa. Contraindications: Non toxic, non irritant, possible sensitisation in some individuals. Major biochemical compounds: Citronellol, Geraniol, Citronellyl formiate, Geranyl formiate.